This trip is operated through a local agent that really enjoy seeking out opportunities to show and involve you in everyday Russian life from riding the metro in Moscow to joining the Babushka’s in the hunt for a bargain in the local markets! As well as including the must-see sites, our itinerary is specifically designed to promote as much contact with the local people as possible; in both Moscow and St Petersburg much of our travel is by metro and we also take an overnight sleeper train between these two cities. These encounters provide both sides with the opportunity for genuine cultural insight. We also choose to eat out in independently run restaurants wherever possible to sample different specialities, thus helping to support a variety of locally run small businesses. 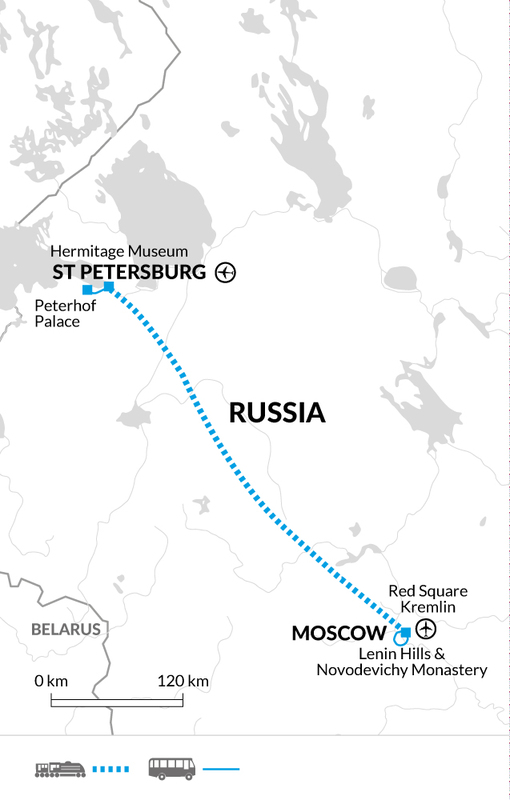 The overnight train from Moscow to St Petersburg. The sites of interest were amazing but in mid-summer there are too many fellow-tourists to see anything at leisure. research in advance as there is a surprising amount of time where nothing is arranged and you need to organise your own trips to museums, churches, etc. Insofar as we almost invariably took public transport and didn't add to the traffic -yes, we reduced environmental impact - minimally. This is a short but intense look at two really important cities of culture and history. I found the logistics tiring and the crowds overwhelming. Hi Joyce. Thank you for your review of your trip. I’m pleased to hear that the overnight train was a memorable experience and that the places of interest were exciting. We do cover a lot of highlights in this trip, which means there can be a lot of walking around the sights. It’s for this reason that we rate the pace as moderate, as typically the days are fairly active and busy. There is free time included within the itinerary, which can either be used to relax and recharge your batteries or to arrange the recommend optional activities/excursion. All our optional activities/excursion are listed and referenced within our trip notes, however your tour Leader should have provided additional guidance and support in assisting to arrange this for you during your trip. You’ve kindly written to us with additional comments regarding your tour Leader, which we’re investigating and will respond to you in due course.